• APPs are plasma proteins that rapidly increase (or decrease) in concentration in response to inflammation, infection or trauma. • APPs provide an objective measure of the health status of an animal because their concentration is related to the severity of the underlying clinical condition. • Due to the speed of the APP response, measuring APP concentrations can help identify sub-clinical (before symptoms) conditions. Serum CRP levels increase dramatically within 4 – 6 hours of an inflammatory stimulus. If the inflammation ceases, CRP concentrations in the blood peak within 48 hours and then return to normal level within 1 – 2 weeks. This acute response to a broad spectrum of inflammatory stimuli (bacterial infection and tissue damage resulting from disease or injury) provides a rapid and reliable measure of disease progression and recovery. Our application notes on the uses of CRP in veterinary medicine and using CRP to monitor resolution and recurrence in canine steroid responsive meningitis-arteritis (SRMA) can be seen below and provides insights into the significant value this can provide to canine health. To find out more about the applications of acute phase proteins in veterinary medicine, please contact our Technical Support team. Both assays have very good correlation to each other and can be used interchangeably as required. 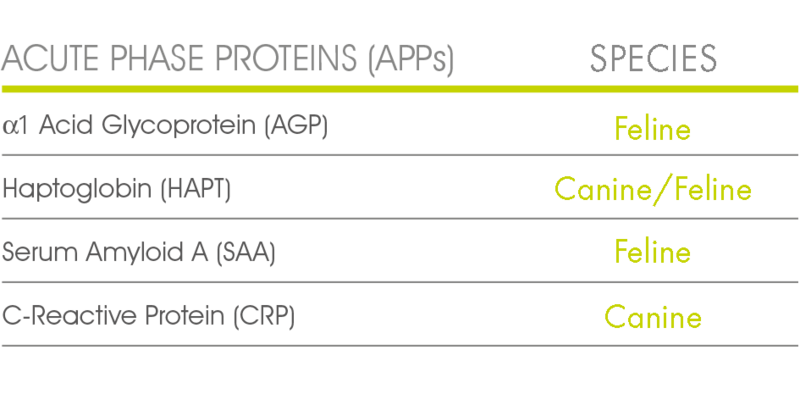 The use of acute phase proteins (APPs) in veterinary diagnostics has been subjected to much discussion over recent years. The tests are very sensitive, reproducible and cost effective, yet they have failed to become a routine tool in diagnosing and monitoring disease in small animals. 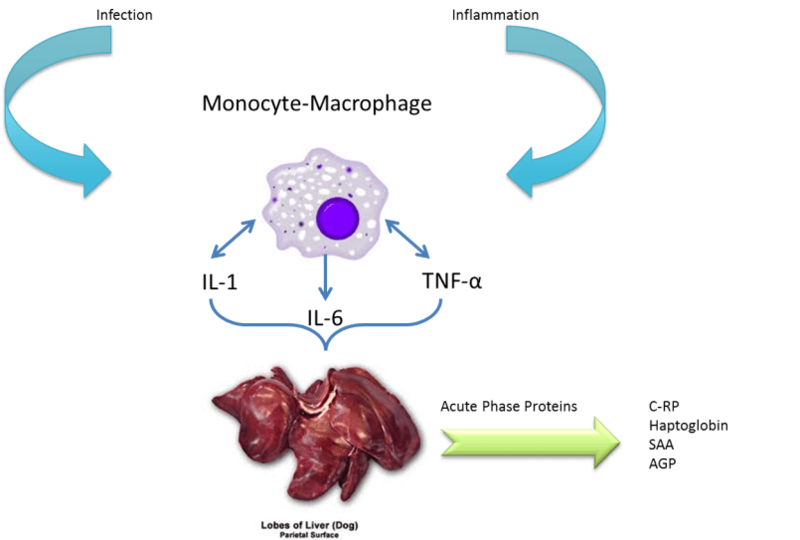 In human medicine the C reactive protein (CRP) test is one of the most commonly requested assays by physicians, where it is used as a broad spectrum test for inflammation and to monitor if anti-inflammatory drugs are working effectively. Despite CRP playing a similar role in the dog, to date it has not been used widely in veterinary medicine. APPs are highly sensitive indicators of inflammation but they do lack specificity. It is likely that the lack of specificity plus the fact that APP testing has been suggested for a bewildering range of applications has resulted in the tests being underutilised in the veterinary clinic. However, APP testing can be very useful when employed in the right situations. This application note has therefore been prepared to summarise the key areas where the CRP test can offer significant clinical value in canine health. Acute phase proteins are very sensitive markers for a broad spectrum of inflammatory based diseases. Although not specific for any particular condition, C-reactive protein (CRP) has been successfully used to monitor resolution and recurrence in canine steroid responsive meningitis-arteritis (SRMA).The disease is widely known to respond well to treatment with prednisolone. However, drug side effects frequently mask recovery during the therapeutic phase. Monitoring the dog during this period by cytological examination of cerebrospinal fluid (CSF) is invasive and has been shown to be unreliable. CRP testing is a useful tool in these circumstances since it can differentiate between clinical signs resulting from residual SRMA induced inflammation or the adverse effects of prednisolone itself.